This third shot in a series of four was made from below the Capitola Pier. With nearly no available light, I pushed the iso to 400 in order to shoot at f/16. Using mirror lock-up and bulb, I opened the shutter for 7 minutes. The lack of ambient light and wave action makes for a shot reminiscent of an adventure with ScoopyDoo™ and the Mystery Machine. When I made my first pictures of the Capitola Pier, I didn't realize that my shadow had been etched into the image (see Selfie @ Capitola Pier). So naturally, I decided to return on the following evening. Much like the first experience, we arrived after sunset, the fog rolled in and the pier's lamps made for an eerie glow. Cautious about staying out of the shot this time, I preset the tripod just beyond the ocean's waves and looked around to be certain that I was in the shadow of the pier. Using a cable release and mirror lock-up, I set my iPhone timer to 5 minutes and the lens to f/16. While I preferred the light from my first evening, I really like the way the fog scatters the lamplight into random beams. On a recent visit to relatives along California's central coast, we stole a few hours to photograph wildlife in the Elkhorn Slough and some nearshore landscapes. While blue skies and warm temp's were a nice departure from Minnesota's frigid winter, these are not optimal lighting conditions for making landscapes. As we were paddle boarding in pursuit of some eye-to-eye contact with marine mammals, I saw this rickety old pier in the distance and thought it might make for a fun nighttime subject. 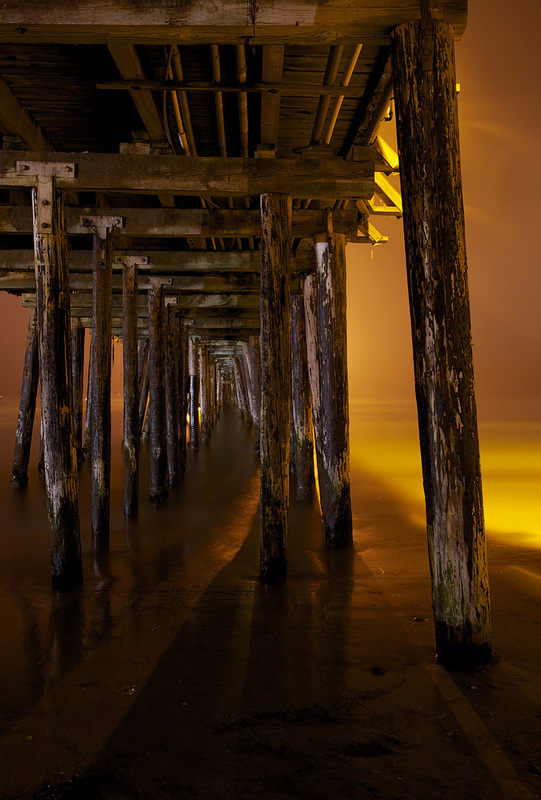 What follows will be a brief series of images of the Capitola Pier photographed long after sunset. Today's post is, "The Selfie."